Many institutions continue to be frustrated with inferior archiving solutions. The reality is most production archives, including legacy PACS archives and vendor neutral archives (VNA), lack adequate scalability, performance, interoperability, reliability, availability, data quality, and even the fundamental support of contemporary standards required for today’s enterprise-scale implementations. PACS archives and most VNAs have fallen short, and institutions are demanding more. Visage is proud to offer Visage 7 Open Archive, delivering a step-change of archiving for enterprise imaging. Visage 7 Open Archive is a core (optional) component of Visage 7, proven to reliably deliver standards-based, ultrafast archive performance. 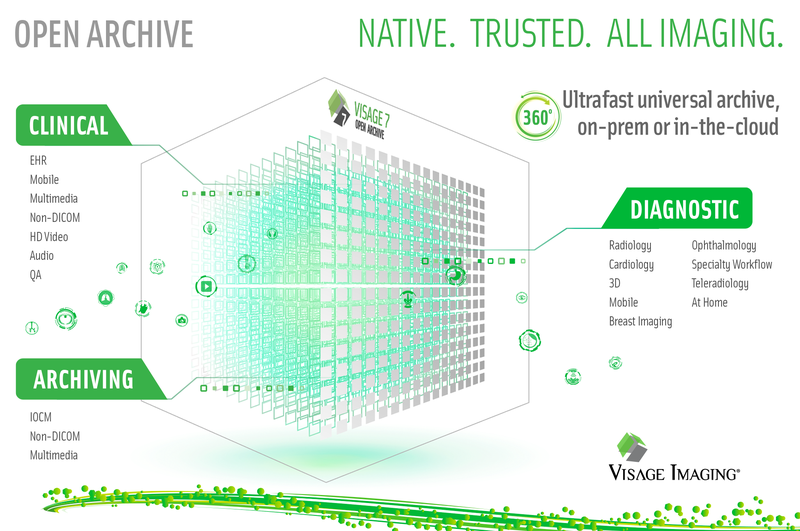 Visage 7’s 360º breakneck speed fuels the most complete combination of diagnostic and clinical workflows with One ViewerTM, plus archiving. And Visage’s signature speed isn’t just experienced at the Visage 7 viewer, it begins at the archive. Quickly migrate from your legacy PACS or VNA without diagnostic disruption, and zero downtime. Visage 7 Open Archive includes an Open Archive architecture, delivering optimal support for imaging informatics modularity, while truly addressing the archiving needs of enterprise-class implementations. What’s differentiating is that Visage is arguably the only vendor that allows customers to choose what solutions they want from Visage, and if they want, other modular solutions from other vendors. The same is true down the road, where if customers choose years forward to implement a new workflow provider, or go EHR-driven, that’s fine. Visage empowers choice, the best of all worlds, all in your control. Visage has replaced dozens of legacy PACS systems and has integrated Visage 7 to the most widely used VNAs. Our perspective is based on actual production experience – the good, the bad and the ugly, providing intelligence into what’s working well, what’s not working, and what needs to improve. Visage has focused our collective experience into Visage 7 Open Archive, with unrivaled professional and (optional) migration services to help our customers achieve enterprise imaging success. Visage 7 Open Archive is a native, (optional) modular component of the Visage 7 Enterprise Imaging Platform, including enterprise-class: speed, capability, and scale. No additional software is required. High-performance imaging archive, enabling the archiving of diagnostic imaging, non-DICOM, non-radiology and medical multimedia objects. Open Archive architecture delivers best-in-class interoperability with modular imaging informatics solutions, supporting the strategy of Deconstructed PACS. True standards-based neutrality, with a foundation based on DICOM, IHE, HL7, FHIR and web services. Support of Imaging Object Change Management (IOCM), which is fundamental to automating integration to enterprise viewing platforms. FINALLY an ARCHIVE THAT WORKS. Learn more. Contact Visage, and you'll regain archive confidence like never before.